We had previously worked with Vannellia Velez in helping her design her WordPress website a few years back. Now that her team has flourished she wanted to represent this on a newer platform. 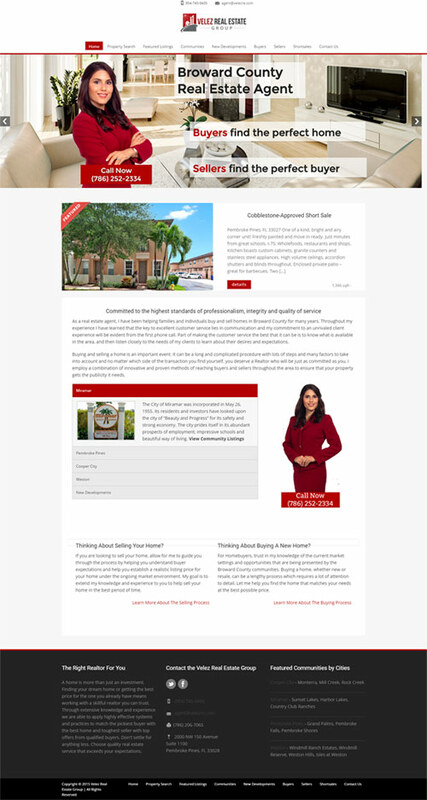 She came to us for help again, to help her updated her website from reflecting Vannellia Velez as a singular unit to a team – specifically the Velez Real Estate team. As you will see in the home page we have added team pictures and quick bios to introduce them to their target market visitors as well as testimonials by prior clients. We have created individual pages for communities that they are specifically targeting, complete with amenities, maps and images. Who is the Velez Real Estate Group exactly? They are a South Florida real estate group that help buyers find the perfect home, sellers find the perfect buyer for their homes and investors the perfect investment property. They are a group of well rounded and knowledgeable individuals who truly care deeply about their clients and making their experience a great one. Designed by Clicc Media Inc.